Today, I bring you another dish that includes a vegetable I’ve harvested from my edible garden. 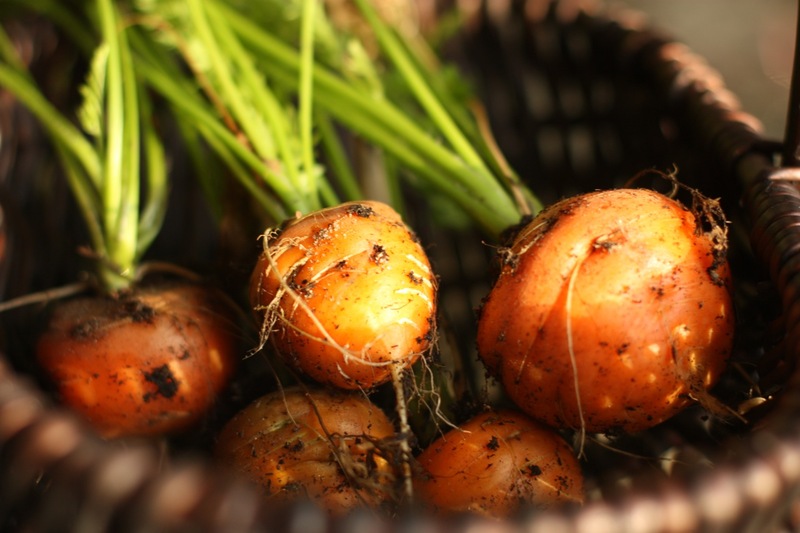 I pulled the first bunch of lovely “Round Romeo” carrots this week, which I planted back in October. At the time I sowed the seeds, their uncommon round shape intrigued me and looking back, I think I planted them primarily for their novelty. However, upon tasting them, I was pleasantly surprised by these smooth-skinned carrots and their sweet flavor and crunchy texture; they are delicious! I used a couple of them for these cupcakes, along with some regular carrots I already had on hand. I am going to steam the rest and toss them with a little butter and chives to fully enjoy their uniqueness and flavor. I really like carrot cake, but inexplicably, I have never thought to make it until now. I don’t really care for versions that include pineapple, applesauce, or raisins so I chose this cupcake recipe from the Food Network website that is free of all those ingredients. I must admit that a huge reason why I am such a fan of carrot cake is because of the traditional cream cheese frosting used to ice them and these cupcakes seem like a good vehicle for the massive quantities of frosting I plan to devour. Since it is the height of citrus season, I added some orange zest and juice to the cake batter and to the icing. 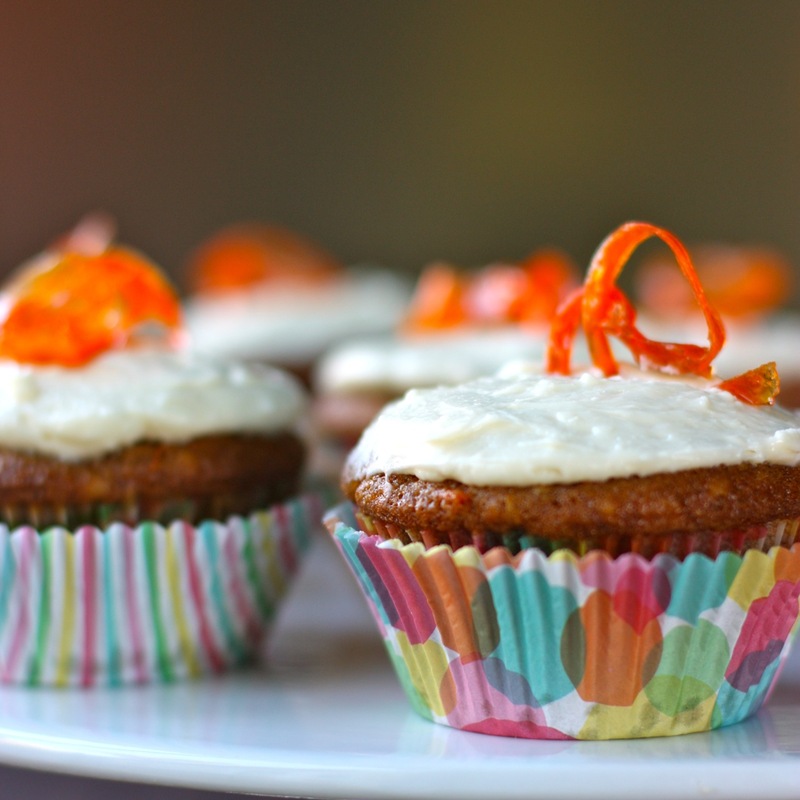 These orange-laced cupcakes turned out so moist, full of flavor and absolutely yummy! They’re perfect in the morning for breakfast or as a sweet ending to meal. They are my new favorite things to make (and eat). The one little hiccup I had with this recipe was with the candied carrot topping. The strips of carrot came out of the oven way too sticky to handle or to arrange into any sort of attractive shape before hardening. They were difficult to eat and stuck to my teeth. I like the idea of this topping, though, since they add great color and crunch so I’ll keep working on getting them right. Suggestions are warmly welcomed. 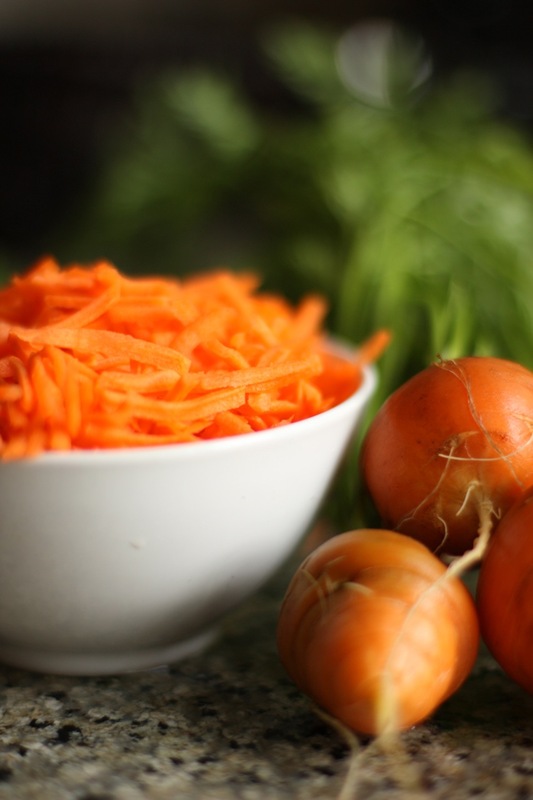 To make the topping, peel long ribbons from the carrot using a vegetable peeler, then slice the ribbons lengthwise into 1/4-inch-wide strands (you’ll need about 12). Preheat the oven to 250 degrees F. Bring the granulated sugar and 3/4 cup water to a simmer in a saucepan over medium heat. Add the carrot strands and simmer until soft, about 10 minutes. Drain and cool slightly. Arrange the strands on a parchment paper-lined baking sheet. Bake until dry, 25 to 30 minutes. Let cool completely. To make the cupcakes, raise the oven temperature to 350 degrees F. Line a 12-cup muffin pan with paper liners. Put the flour, walnuts, baking powder, baking soda, salt, cinnamon, ginger, allspice, and orange zest in a food processor and pulse until the nuts are finely ground. Set aside. Whisk the grated carrots, vegetable oil, granulated sugar, eggs, orange juice, and vanilla in a large bowl until combined. Stir in the flour mixture until just combined. Divide among the muffin cups, filling each three-quarters of the way. Bake until a toothpick comes out clean, about 25 minutes. Transfer to a rack and let cool 5 minutes, then remove the cupcakes from the pans to cool completely. For the frosting, beat the cream cheese, butter, orange juice and honey in a stand mixer fitted with the paddle attachment until smooth and fluffy. Add the powdered sugar in two additions, beating until smooth. Transfer to an airtight container, and refrigerate for at least one hour to set. Pipe or spread on the cupcakes. Top with the candied carrots. I tried this recipe i liked iti very, very much.It is the best carrot cake recipe i tried till now.I posted my photos on my blog.The next recipe i will try from your blog ist the meyer lemon mascarpoe bars.Thak you and have a nice week. …”the massive quantities of frosting I plan to devour.” Ho! How I can taste it from here! But the best part is the cupcake of course, because not only do the wholesome ingredients make them taste heavenly, but they absolutely cancel out any guilt one might otherwise experience. Isn’t that true? A sudden thought comes to mind regarding the decorative topping. How would dehydrated carrot slices do? Perhaps arranged so they fan out from the middle. Then, part of the unspeakably delicious experience of ingesting these cupcakes would be to begin by carefully removing and eating each carrot slice… with a good chunk of frosting attached. The perfect marriage of crunch and sweetness. I like your suggestion of dehydrated carrot slices, Granny, but can I do that without some sort of machine? I will have to research it. Utterly lovely. Re the topping: my only suggestion (and this is just a thought) is to coil them around an oven-safe dowel, much as you would if making sugar candy. But I think you’re being an overly harsh self-critic! I think the candied carrots are beautiful. Those home grown carrots are so beautiful!! So cute and I want them 🙂 Ok – I’m passing this recipe to my husband – he loves muffins, i live cream cheese frosting. This looks like a winner 🙂 Will let you know! Thank you! The photo of your carrots is gorgeous!! I love it! 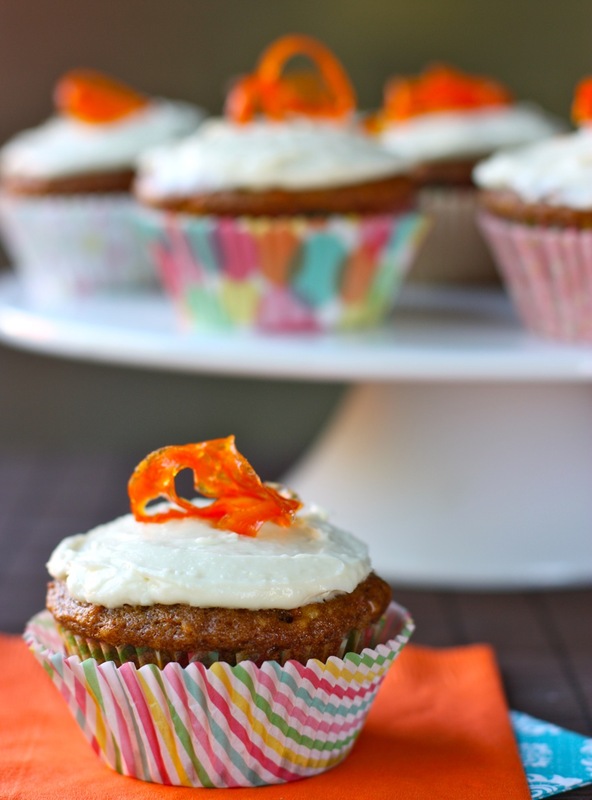 Your cupcakes look delicious and I agree with a previous commenter – the candied carrot topping is fabulous! Hugs! How beautiful! And they look so delicious. I really need to go eat breakfast because I’m drooling LOL. The candied carrot topping caught my eye immediately — it might be the best thing about this recipe.